This was a delightful and enchanting story, accompanied by beautiful illustrations. It was a wonderful retelling of Sleeping Beauty and Snow White, with a brilliant twist. I’d highly recommend this to anyone who can read and I think children in particular would really love this book. I thought the illustrations really brought the story to life and added a lot to the creepy and dark atmosphere of it. And the cover is just spectacular. It’s also a lot prettier in person because the picture of Sleeping Beauty is printed on the naked hardcover and the jacket is made of vellum so that the illustration shows through. I love how The Sleeper and the Spindle challenges the gender stereotypes that we have. We have Snow White (except she’s only known as ‘The Queen’ in the book) who is about to be married to her prince but thinks it’s the beginning of the end of her life. She decides instead to go off and be a warrior and a hero, highlighting that women aren’t weak and we don’t need a prince or a man to save us. Or to kiss us. I wouldn’t really consider this to be an LGBT retelling. There’s really no romance at all in the book. I know a lot of people were disappointed that it wasn’t a proper LGBT book but I’m thoroughly satisfied with everything we got. It had an epic plot and some very likeable main characters. I couldn’t ask for anything more. This was my very first Neil Gaiman book but I definitely need to pick up more titles by him. His writing was so beautiful! Let me know your Neil Gaiman recommendations! I’d also love to hear your thoughts if you’ve read this book. Try to keep your comments spoiler free though! It’s not easy being Magnus Bane. As a warlock, he’s often called upon to fix the problems of others. His life has been long, and his loves have been many. And Magnus has a way of making sure he’s at the right place at the right – or perhaps wrong – time. The French Revolution Prohibition, the great blackout of New York City, the first great battle between Valentine and the New York Institute… Magnus was there, and usually in the middle of it. But smuggling Marie Antoinette out of France is nothing compared to loving a vampire like Camille Belcourt – or having a first date with Alec Lightwood. Though Magnus’s tale is far from over, these stories shed a little light on his often inscrutable character. What happens when an immortal warlock goes mad? Are all Herondales as problematic as Will? (Answer: yes.) What exactly happened at the Hotel Dumort? How did Raphael Santiago become a vampire? What do you buy for your Shadowhunter boyfriend when you’re not really dating? And why was Magnus banned from Peru? Magnus will never be able to tell all of his tales. No one would believe him. But here are eleven stories that fill in some of the blanks – stories he probably wishes had never gotten out. The Bane Chronicles is a bind-up of 10 short stories that were originally published in e-format, plus a bonus story that is exclusive to the physical bind-up. Each of these stories centre on a particular event in the long life of Magnus Bane. I think this collection of short stories is perfect for anyone who loves the Shadowhunter series and Magnus Bane. It answers some questions about Magnus that were never addressed in The Infernal Devices and The Mortal Instruments. I would recommend reading the Bane Chronicles AFTER those books because there are references that you wouldn’t be able to understand if you haven’t already read the other Shadowhunter books. 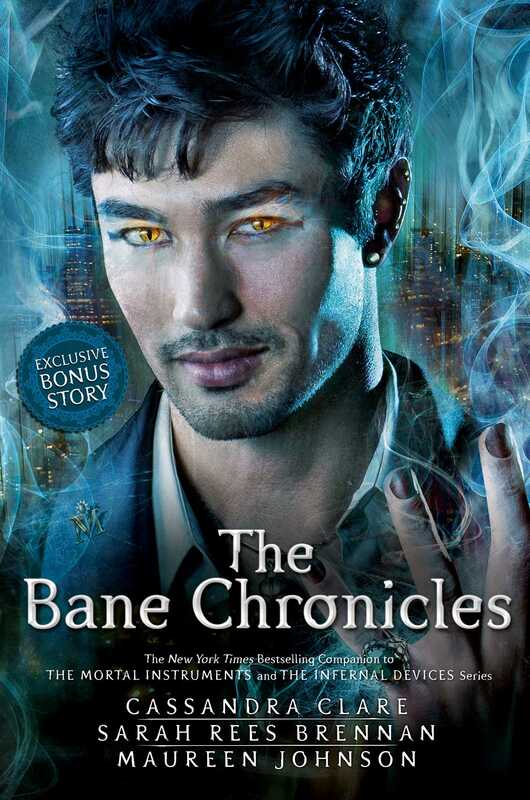 The Bane Chronicles doesn’t contain any major spoilers, but there are things that are mentioned in the short stories that might take away from the reading experience of The Infernal Devices and The Mortal Instruments. Overall, this was a very enjoyable collection of stories about Magnus and various characters that appear or are mentioned in The Infernal Devices and The Mortal Instruments. There were some stories that I liked better than others but I’d rate most of the stories 4-5 out of 5. They all had very humorous aspects and we definitely get to learn more about Magnus’s past, as well as about his warlock friends, Catarina Loss and Ragnor Fell, who don’t get mentioned very much in the series. Each of the stories began with a one-page graphic of a scene from the story, which I really enjoyed and appreciated. Why did Magnus get banned from Peru? Features Magnus’s adventures in Peru over a couple of decades. Ragnor Fell and Catarina Loss make appearances. How Magnus meets Edmund Herondale (Will Herondale’s father) and how Edmund falls in love with Will’s mother. Also features Magnus’s first meetings with Camille Belcourt. Magnus meets a wild James Herondale one night and brings him home to the London Institute. He then goes to see his client, Tatiana Blackthorn, at the Blackthorn Manor, where he meets Tatiana’s ward, Grace. This story features a lot of Will, Tessa and Brother Zachariah! And gives us a taste of what The Last Hours (Cassandra Clare’s 4th Shadowhunter trilogy) will be about. A 2000 year old warlock goes a bit crazy in the Hotel Dumont… Camille Belcourt might be involved somehow. This is a heartwarming story about how Raphael became a vampire and his struggle to be reunited with his family. Something is wrong with the vampires and Magnus must try to make it right (for Camille’s sake) before the werewolves or the Nephilim interfere. In this story, we get a glimpse of the ruthlessness of Valentine and The Circle, as they carry out raids and murder Downworlders. How was Magnus involved? And how did he end up agreeing to help out Jocelyn Fray? The story about Magnus and Alec’s first date. This was my favourite short story in the collection! A series of voicemails that Magnus receives after his and Alec’s relationship takes a turn at the end of City of Lost Souls.